Rabbits can make very good house pets, if you know how to look after them properly. A well-cared for bunny can share your home and heart for seven to 10 years. You might be surprised how smart and sweet a bunny can be. Because rabbits don't deal well with heat, keep your bunny in an area where the temperature doesn't rise above 70 degrees. Your bunny needs a cage as home base. It's a place he can feel safe and secure, as well eat, drink and use the litter box. According to the ASPCA, the minimum size cage for a small to medium rabbit is 4 feet wide and 2 feet tall and deep. Larger bunnies require larger quarters. Since wire can harm Bunny's feet, purchase a cage with a solid bottom or make a wooden floor. Keep it amply supplied with hay for chewing and straw or shavings for nesting. He'll also need an enclosed, escape-proof exercise area for kicking up his heels, or doing "binkies." Just like cats, rabbits can be taught to use the litter box. However, you can't use clay cat litter, so purchase litter made from recycled newspaper or wheat products, or use commercial wood shavings. Place a little hay in the box -- bunnies poop while eating. When he's "done his business," give him a small treat, such as a piece of fruit, so he knows the box is the place to go. If you find loose droppings in the box, call the vet. Diarrhea in rabbits might have serious consequences. Because rabbits chew and dig, bunny-proofing your house is a must. They don't discriminate much -- carpets, furniture, electrical cords are all fair game for tooth exercise. For that reason, many rabbit owners don't let Bunny have free run of the house, only letting him out when he's supervised. Keep him well-supplied with chewable toys so he's less tempted to snack on undesirable or dangerous items. Just as with cats and dogs, spaying and neutering your rabbit can make him a much better house pet. He won't be thinking about baby-making -- a well-known rabbit preoccupation -- and won't feel a need to mark territory with urine. The rate of uterine cancer in unspayed females who aren't bred regularly runs as high as 50 percent, according to Petfinder. Since rabbits procreate so easily, never introduce two rabbits if you aren't positive they're fixed. Since many veterinary practices don't service bunnies, ask local rabbit organizations for vet recommendations for spay/neutering and general rabbit health issues. Spayed and neutered rabbits can bond, keeping each other company and indulging in mutual grooming. Generally, cats sharing your home won't bother medium to larger rabbits, but keep them away from babies and small bunnies. With dogs, much depends on canine breed and training. Never leave any dog alone unsupervised with a rabbit. Petfinder: Do Rabbits Make Good Pets? 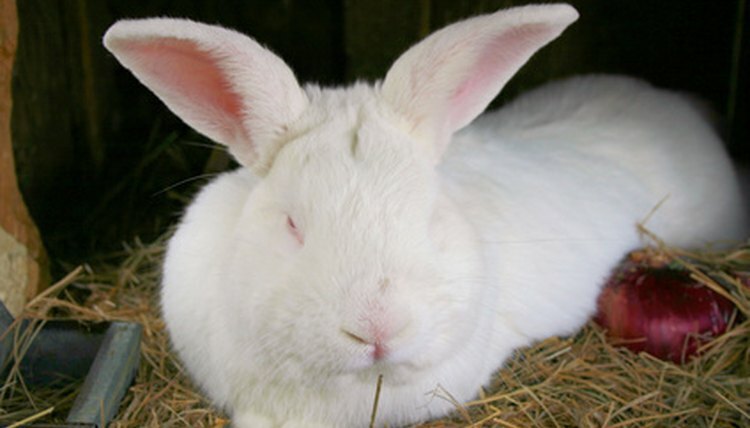 Washington State University College of Veterinary Medicine: Is Your Bunny Healthy?